We went out on a daytime swordfishing trip today and had a great trip. We started off trolling lures offshore in hopes of a marlin, sailfish or whatever else would bite. We caught a tuna and a couple small-medium sized dolphin on the way out to fishing grounds. Once we got out to swordfish territory, we set up our electric reels and did our first drop. We use electric reels for daytime swordfishing because you need to drop the bait so deep to get it to where the swordfish are, 1100-1500ft down. We are one of the only boats that has an electric reel which also has a hand crank, so you can use the electric reel function to get the bait back when you don’t get a bite or hand fight the fish if you hook up to one. Swordfish laying on the deck of the boat, just after being caught. BAMMO, as soon as the bait hit the bottom, we hooked up. We must’ve dropped the bait directly on his head. The angler got into the chair and we fought the fish all the way to the surface. 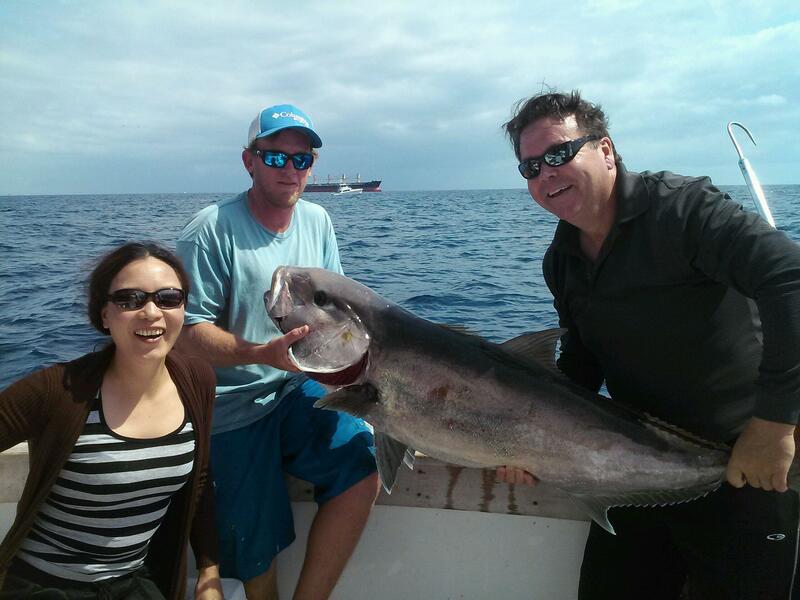 It wasn’t the biggest swordfish in the world, but it was a nice keeper size one, probably a 75 pounder. We gaffed the fish and threw him in the boat. 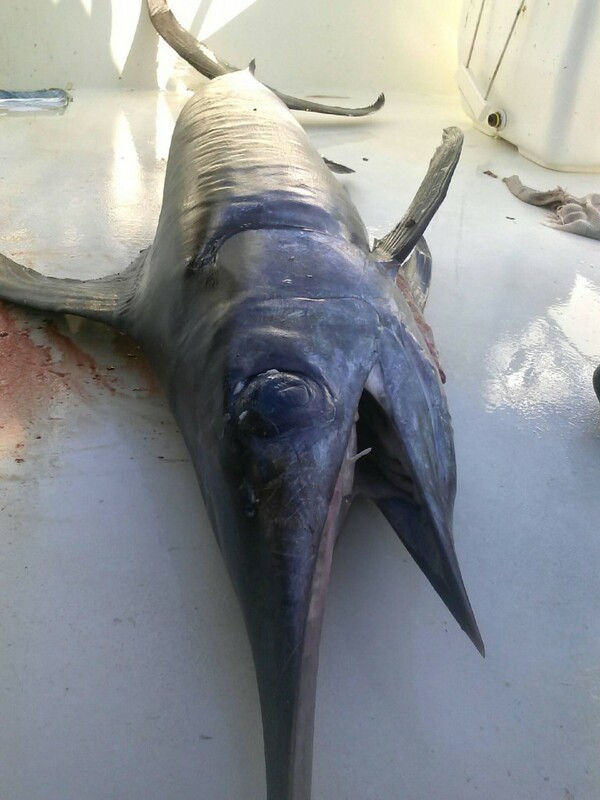 Any swordfishing trip where you successfully capture a swordfish is a good trip. Well, there’s only one thing better than a swordfish in the boat and that’s to have 2 swordfish in the boat! We dropped again a few more times but never got another hit on a swordfish. Time was running down, so we put our lures back out and began trolling home. A nice swordfish and a rack of dolphin at the dock at the end of the day. There were some nice weedlines formed offshore, so we trolled along them for a while. We hit a couple more good size dolphin trolling and then finally hit our really big bull dolphin making the day and putting icing on the cake. The biggest dolphin was over 25 pounds and was a solid, really nice bull. The dolphin fishing offshore this time of year is phenomenal and if you’re out there with enough time to try it, there are some swordfish biting too. 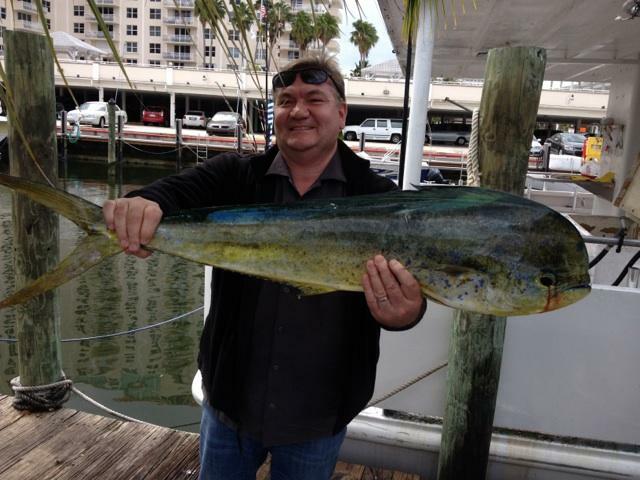 You can catch anything this time of year when fishing offshore of Fort Lauderdale. This is one of the best months of the year to come out on a fishing trip. Good luck to everyone fishing this week. I’ll sea ya on the water. The fishing is heating up in Fort Lauderdale this week. Sharks are snapping in 350ft of water. Hammerheads, makos and thresher sharks are all out there and moving through in strong numbers. Head out about a mile and a half offshore, set your baits and wait a bit. Chum the water and hum the theme to Jaws. You won’t have to wait too long to get a bite on something that is probably larger than you are. These monsters are 8-12ft and 200-400 pounds. 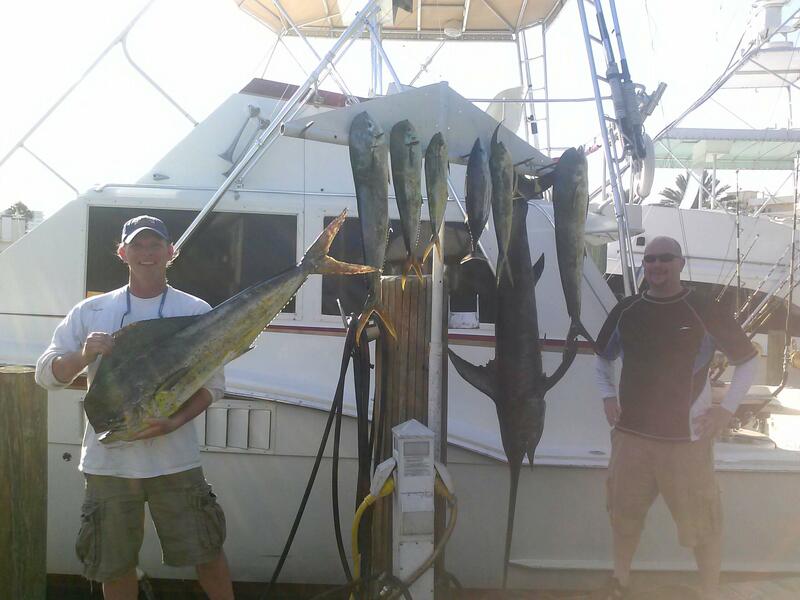 While you’re shark fishing, you may even pick up a big dolphin or a sailfish, everything is biting this time of year. 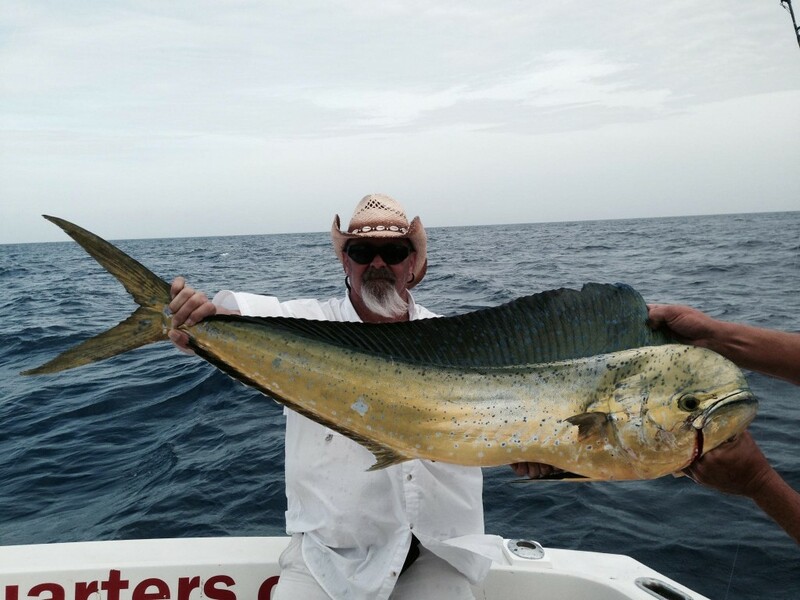 Nice dolphin just caught on a sportfishing charter. Big dolphin have been a big hit this month. 10-20 pounders are hitting the docks every day and a few dolphin even bigger. This is the best time of the year for the big dolphin in Fort Lauderdale. 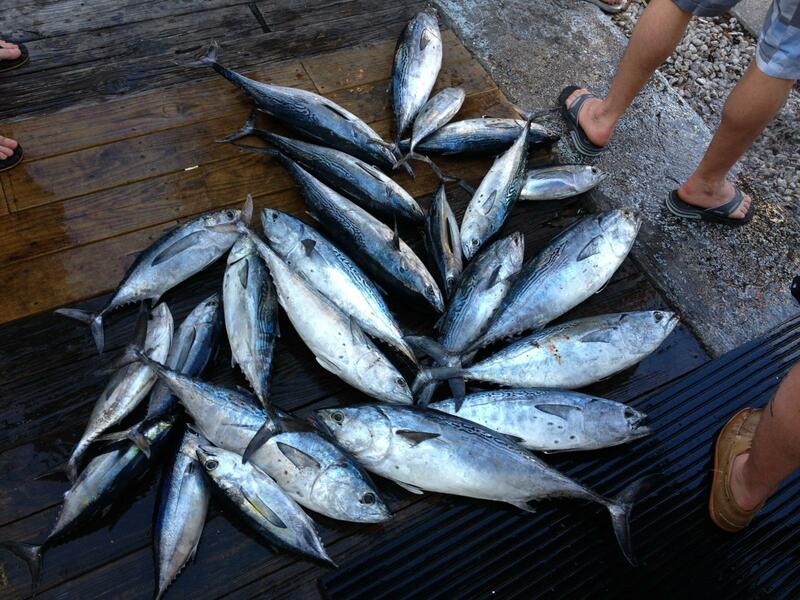 Wahoo, tuna and sailfish are also swimming in the same waters and eat the same baits, so we’re catching them too. We should have continued good dolphin fishing through June when it will subside and the fish will head much further offshore. Until then, it’s game on! Nice amberjack caught deep dropping over a shipwreck. Amberjacks are also a big hit this month. Amberjacks, or AJs as we call them, are abundant on and around our local shipwrecks. They stay close to the big structure and feed on all the smaller fish that also make the wrecks their home. Amberjacks are voracious feeds and an extremely strong fighting fish. They put up a great fight, even on the heaviest tackle, making them an attractive gamefish. Drop a live bait down next to a shipwreck in 200-400ft of water and you shouldn’t have to wait long to get hooked into a big amberjack. Tilefish are another deep dweller but these guys are really deep. 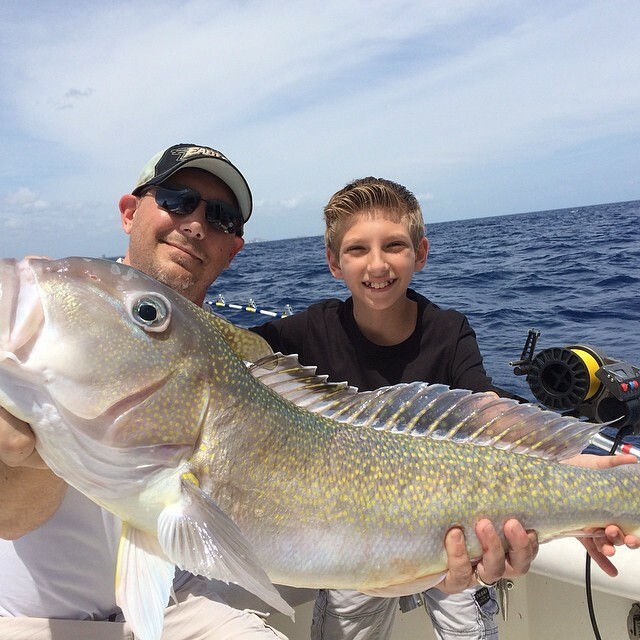 We catch grey tilefish in 400ft of water and golden tilefish in over 600ft of water. These are one of the tastiest fish in the ocean. Tilefish fight all the way up from the bottom, struggling the whole way. While other fish like groupers give up half way up, tilefish don’t stop their fight until they are in the fish box. We’re having an excellent year on these deep dwelling bottomfish, they are almost a guaranteed bite. 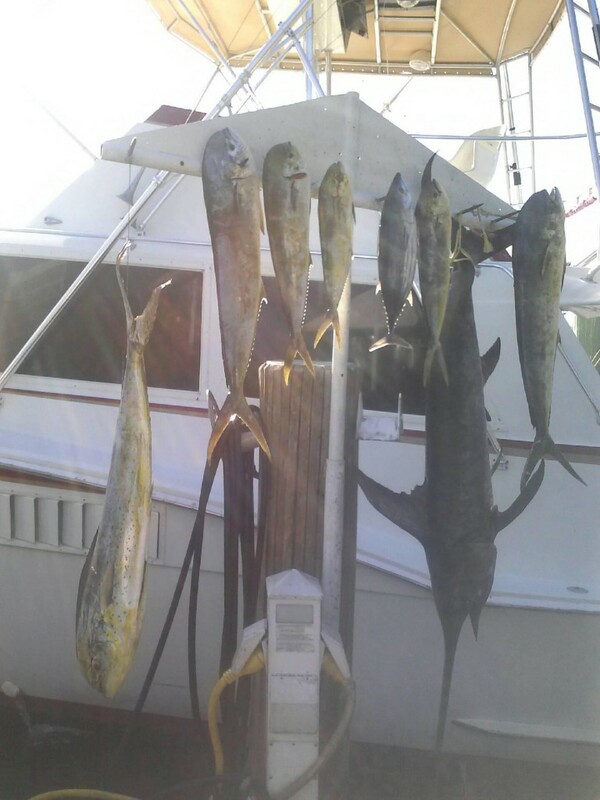 Nice catch of bonitos and tunas on a sportfishing trip. Just about everything is biting out there this time of year, even bonitos and tunas. While the massive ‘bonito run’ won’t begin until late July, there are some schools of them showing up already. Mixed in with those bonito are blackfin tunas. Like I said, everything is biting! 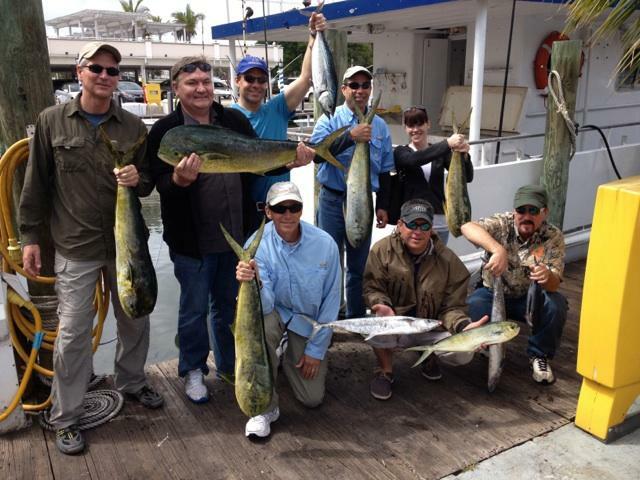 This is a great time of year to come fishing in Fort Lauderdale. We wait all year for the good fishing we’re having now so come on out while the bite is good. Let’s go fishing! 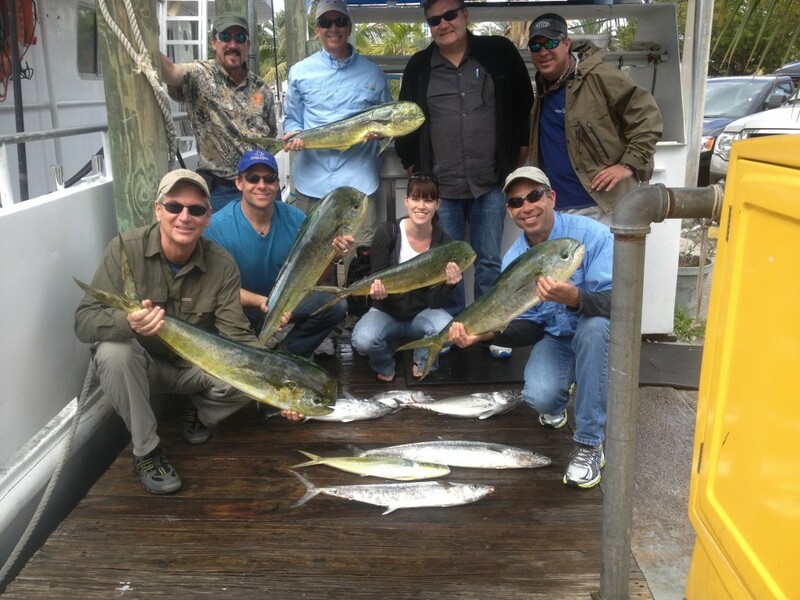 Our all day dolphin trip today had a great catch of dolphin. 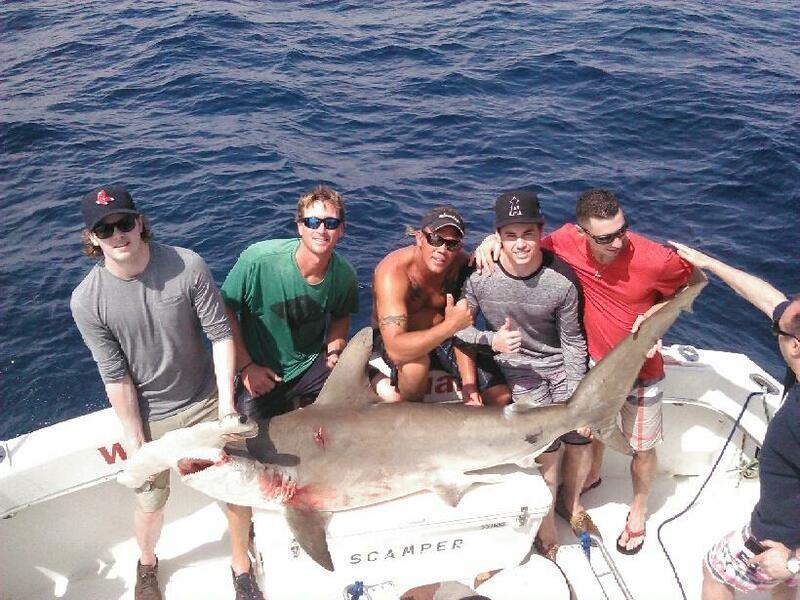 They were biting in 150-400ft of water, just 1-2 miles off Fort Lauderdale beach. We caught them scattered along the blue-green color change which is the edge of the Gulfsteam. This warm water current, brings with it all the migratory fish, such as dolphin, tuna, wahoo, sailfish and more. Today, it was dolphin and almost all the fish we caught were really nice ones. Only one of the dolphin was under 10 pounds and the largest was 24 pounds. The dolphin were scattered and not schooled up. We only caught 2 of the dolphin together, the rest were randomly caught throughout the day. Usually, when we find dolphin, we find them all clumped together in a big school. Today was not like that. We caught them sporadically throughout the trip along weedlines, under birds circling low to the water and near floating debris. It was more fun this way for us because there was action throughout the trip. The dolphin bite is hot in south Florida right now. This is the month that the dolphin come into the reef to do their annual spawning. If you want to come out on a great trip to catch some mahi-mahi, do our all day trip aboard the Mary B III or a sportfishing charter. Good luck to everyone fishing this week!